Are you still struggling with the couple of freezer baskets your freezer came with — or worse, none at all? Maybe you’ve started to notice that you can never find quite what you’re looking for in your freezer. Or perhaps the back of your freezer is always stuffed with old, freezer-burned products you can no longer use because you forgot they were there. Your freezer can be just as neat, organized, and easy to use as your spice rack or your tea collection. But it’s not going to happen on its own — you need freezer baskets. If you’ve never given a second thought to freezer baskets before, you’re not alone. In this guide, we’ll give you the lowdown on how useful these simple items can be. Then, we’ll go over the top freezer baskets to buy in 2018. Keep reading to take control over your freezer! Freezer baskets are exactly what they sound like: bins and baskets that go in your freezer to keep things organized. They come in many different styles, including standalone baskets, hanging baskets, stacking baskets, and dividers. 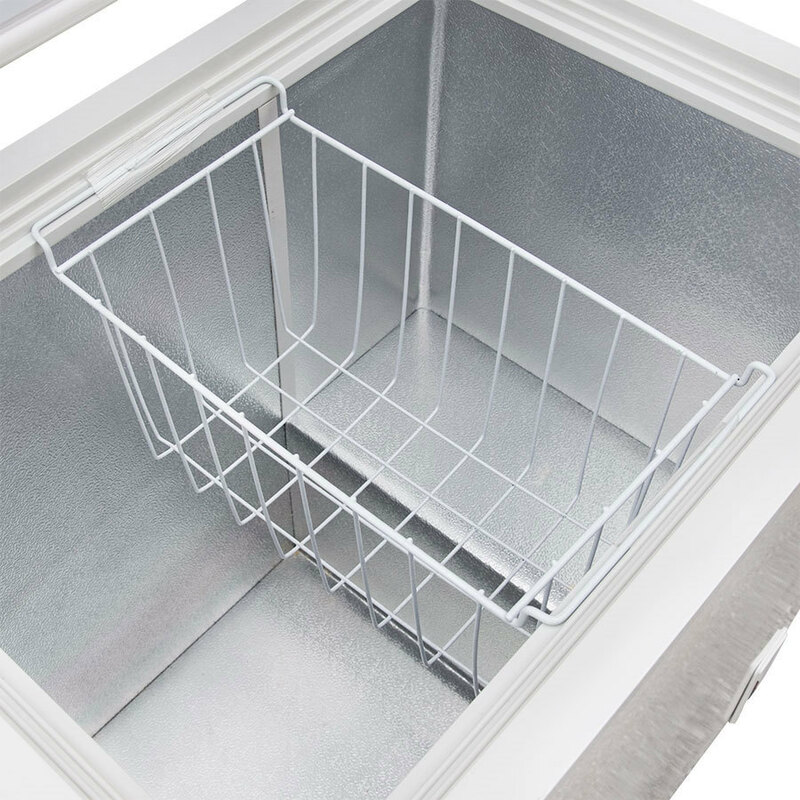 The right freezer baskets for you will depend on factors like what you need them for, and the size and shape of your freezer. However, no matter what style of freezer you have and what you store in it, these baskets make life easier. It may be tempting use things you have around the house to organize your freezer, such as paper bags. Yet freezer baskets are designed to do the job much better. They fit right where you need them, won’t fall apart, and make it easy for you to see exactly what’s stored inside. Still not convinced that freezer baskets are for you? Organizing your freezer benefits you in ways you may not yet realize. You’ll be able to store things so they last longer, and you’ll quickly be able to find exactly the ingredients you need. Most freezers are designed to be open, with minimal shelving. Although you can shove a lot of frozen food into the space without damaging anything, you’ll soon have an ungainly, disorganized pile in your freezer. Baskets keep items from falling out when you open the door, and ensure things are easy to locate. Let’s go over exactly how to get your freezer in order using freezer baskets, step by step. To use these storage solutions effectively, you need to start with a working knowledge of what you can actually freeze. Freezing foods is a wonderful way to make things last longer and stock up on what you need. However, some things will never last in the freezer, no matter how well you store them. Things that don’t do well in freezers include any produce with a lot of moisture, such as watermelon. As you can imagine, that moisture content quickly turns to ice. You also can’t freeze most dairy products, like milk (ice cream, of course, is a different story). And fried foods never hold up well to being frozen. However, you might be surprised by some of the things you can freeze. Use your baskets to store everything from nuts and berries to pancakes and muffins. You can make broths, stocks, soups, and stews in bulk and freeze them. And you can freeze all kinds of meat and seafood to make it last longer. Your foods get freezer-burned faster when your store them with too much air. Choose containers that are almost the same size as your items, or use freezer bags with the excess air squeezed out. Freezer bags are thicker than regular plastic bags, so they’ll keep frozen food fresher. Keeping the air out also helps maximize your space when you’re using freezer baskets. Portioning out your bulk items makes them much easier to use, and freezer baskets are a great way to keep those smaller portions handy and organized. After your latest journey to the bulk foods store, you probably just throw entire large packs of frozen food into the freezer. However, when you’re trying to separate a single portion from the frozen mass of bulk food, it can be frustrating. You’ll make life easier by portioning things out before you store them. Take your bulk packages and separate them into the amounts you’ll realistically use for each meal. Make freezer bags containing a pound of ground beef each, or ten chicken strips. Label and freeze these portions, using freezer baskets to keep them organized. Then, when you need to make a meal, it’s easy to grab what you need and get started. You should always label and date everything in your freezer, no matter what. Freezer baskets make it easier both to arrange foods so you can see the labels,and to label each section of stored food, too. The places that you store your foods matter. For example, the door is warmer than the rest of the freezer, so it’s not a good place for fatty foods like ice cream that are more likely to melt. If you use freezer baskets with labels, you’ll always know exactly which items should go where. You can also label each item, so you’ll know how long it’s been frozen, and exactly what it is. You can weigh or measure portions of things like stock in your freezer, so you can choose exactly the right amount for the recipe you’re working with. On the label, include the weight or measurement of that portion. With baskets, you can arrange everything so the labels are easy to see. If you can, flatten your food items when storing them in the freezer. This will make them much easier to fit into your freezer baskets, and uses the space more effectively. For example, if you’re freezing soup, put it into a sealed freezer bag, then lay it on the bottom of the freezer. It will set in a flat shape, and you’ll easily be able to stack it inside a basket without wasting any space. The smaller the item, the more important it is to use a freezer basket. If you’re storing a lot of spice blends or other small items, a freezer basket means you can find what you need without freezing your hands while you search for it. our freezer doesn’t need to be a random jumble of stuff. Use freezer baskets to create separate sections for meats, soups, vegetables, and more. This makes finding the right items even faster. You can also store things by recipe instead of by ingredient type. For example, if you make a lot of smoothies, you could devote one basket to smoothie ingredients, such as fruits, vegetables, and nuts. When you’re running low on ingredients, you’ll know right away instead of digging around for something you don’t have. If you’re cooking frozen food on a regular basis, one of your baskets can be used as a “staging area” where you put the ingredients for your next planned meal. That way, you’ll always have a plan for your meals, and you won’t forget to thaw things out when you need to. If you list exactly what’s in your freezer and cross things out as you run out of them, grocery shopping becomes much simpler. This is also a good way to make sure you use things before they go bad. Without freezer baskets, though, you won’t have the organization you need to see what you have and make an inventory. You’ll find yourself spending less on groceries and cooking more efficiently when you have an inventory system. Instead of forgetting to use things and throwing them out or buying duplicates, you’ll always know what you have on hand so you can use it. Are you sold on freezer baskets now? They’ll simplify cooking, save you money, and best of all, they don’t have to cost a lot. 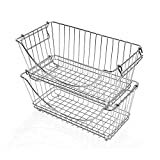 There is a wide range of freezer baskets at all different price points. Simple designs in materials like plastic are the least expensive, while fancier designs made of metal cost more but last longer. However, even at the lowest prices, you’ll still see the benefits of using baskets to keep your freezer’s contents in line. Which basket design is right for you? Let’s take a look at some of the year’s top-rated freezer baskets, based on consumer reviews. The best freezer baskets aren’t always designated just for freezers. This is one of the highest-rated kitchen storage baskets on Amazon, and it’s great for freezer use. A pack of 4 in the “deep” size isn't the cheapest, but they’re still quite affordable. The rust-resistant, sturdy steel wire holds up well over the years, and the built-in handles make these baskets easy to pull out of a freezer of any size. They also come in a few different shapes and sizes, with different price points for each. If the “deep” baskets are too big for your freezer, look at some other mDesign basket styles. If your freezer has limited space or you already have some baskets, it might be better to buy individual baskets rather than sets. This basket is made of durable steel, and the “scoop” front makes it easy to reach in and get what you need. The open-wire design also lets you see exactly what’s inside. Spectrum’s storage baskets come in a number of sizes too, so you can choose what works best for your space. To really maximize your space, you’ll want to invest in a hanging basket or two. Luckily, hanging freezer baskets aren’t expensive. The IRIS design hangs from a shelf in your freezer, so you can use all the vertical space. With a hanging basket, it’s easy to reach exactly what you need, and you’ll be surprised by how much more you can store in your freezer. This IRIS basket is durable coated wire, and the size works well with most freezer designs. If you want to maximize both your space and your budget, try the Deep Storage Basket from Grayline. These baskets can hold a lot of large items, and they're one of the best deals on this list. Grayline’s coated steel design will last longer than a plastic basket, and the “extra-deep” size is perfect for large bags of soup, vegetables, and more. Since the baskets are made of wire, you’ll be able to see everything inside, even at the bottom. Finally, stacking baskets are another great way to use your freezer space efficiently. These steel wire baskets stack on top of each other, so you can save space in your freezer. If one basket isn’t completely full, just put the other one on top of it so the space doesn’t go to waste. You can use your vertical space more effectively if you have multiple rows of stacked baskets. The Promart Stacking Baskets also come with handles, so it's easy to get them into and out of a freezer of any size. Freezer baskets are an inexpensive, highly effective way to make your food budget go farther. You probably think throwing out old frozen food is tiresome. Or, maybe you’re just tired of opening your freezer and having heavy frozen packages fall down onto your foot. Either way, freezer baskets are the answer. They'll make your life easier and save you money. What’s not to like? We’d love to hear what you think about this freezer organization idea. Whether you’re excited about freezer baskets or have your own form of freezer storage that works for you, leave a comment and let us know!